Following the successful opening of a museum dedicated to his work designed by Ryue Nishizawa, winner of the 2010 Pritzker Prize, Hiroshi Senju debuts a new series of Cliff paintings. Senju, who is best known for his Waterfall paintings, began exploring the cliff image in 2007. The artist spontaneously applies a layer of mineral pigments onto Japanese paper. The structure of the paper and its subtle creases and wrinkles appear more clearly after this process and inspire the composition of the landscape. He then carefully applies iron, calcite and other pigments onto the paper, allowing delicate rivulets of paint to move across the surface. What emerges are ethereal, intricately rendered images. 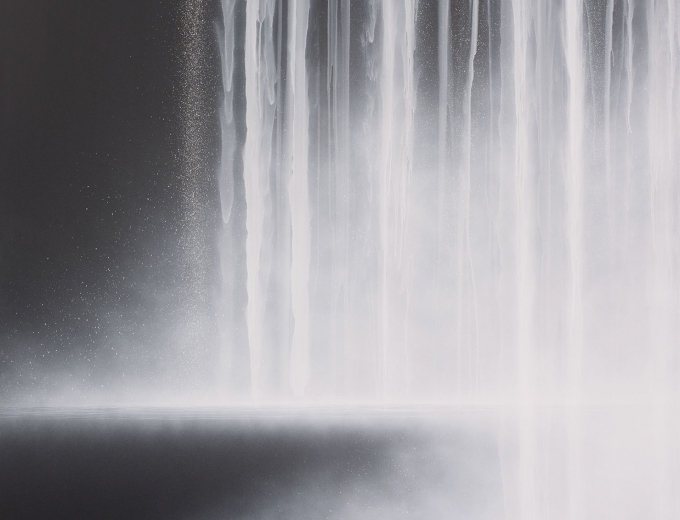 The context for Hiroshi Senju’s art is both the history of international modernist abstraction and Japanese landscape tradition and spiritual philosophy. Widely recognized as one of the few contemporary masters of the thousand-year-old Nihonga style of painting, Senju seamlessly combines traditional Japanese techniques and materials, including mineral pigments made from ground stone, shell and corals, and a modernist vocabulary. Senju began exploring the waterfall image in the early 1990s. With incredible delicacy, he pours translucent paint onto mulberry paper creating the sensation of unrestrained movement. Evoking a deep sense of calm, his waterfalls conjure not just the appearance of rushing water, but also its sound, smell and feel. Critic Donald Kuspit has written that Senju’s work possess an “exceptional clarity and presence.” Senju’s monumental waterfalls (which range up to 82 feet in length) are installed at Tokyo’s Haneda Airport, Grand Hyatt, and Shibuya Cultural Center Owada. The Hiroshi Senju Museum opened in October 2011 in Karuizawa, Japan. About 100 pieces, spanning the years 1978 to 2011, are on display. Hiroshi Senju was the first Asian artist to receive an Honorable Mention Award at the Venice Biennale in 1995. In 2004, he was the art director for the new Haneda Airport Terminal in Tokyo, where he completed his large installation. Senju was also chosen to do a site-specific installation of his artworks for the 2010 summit of the Asian-Pacific Economic Cooperation held in Japan with the participation of 21 national leaders. His work is in the permanent collections of the Museum of Contemporary Art in Los Angeles; The Museum of Modern Art in Toyama, Japan; Yamatane Museum of Art in Tokyo; The Tokyo National University of Fine Arts and Music; and the Kushiro Art Museum, Hokkaido, Japan. Hiroshi Senju divides his time between New York and Japan, where he has been president of the Kyoto University of Art and Design since 2007.